By LUDWIG VON KOOPA - And now a campaign of true horror begins. It is finally official, though very unsurprising: Hillary Rodham Clinton is the first Democrat Party member to formally announce their run for president! This comes after Rand Paul (I endorsed him in this article) made his announcement for president last week. Marco Rubio is supposed to be coming today but no one really cares about him. So, let's hear straight from the candidate! I embedded Rand's speech in his article, so let's have Hillary say her fair share. ...Wait, what? She didn't make a speech? Her official announcement was silently in the forme of a Twitter update, making a website, and... this trailer? This trailer is awful, woah. But... who cares? It's from Hillary Clinton! What difference, at this point, does it make? Well, more Hillary analysis to follow. Let's look at her announcement style. Apparently her announcement came from a Hillary aide, John D. Podesta, in big-donor e-mails. Then she launched the website and... eventually did the Twitter announcement. Except she was late, so #WaitingForHillary became a hashtag. But, what difference, at this point, does it make? We should be blessed for the Hillary coronation and be thankful it happened at all! It's not like it was inevitable, right? Let's see more about that website. Well, Hillary doesn't respect grammar. First paragraph misses the ending quotation mark. Then we can look at her website in general. 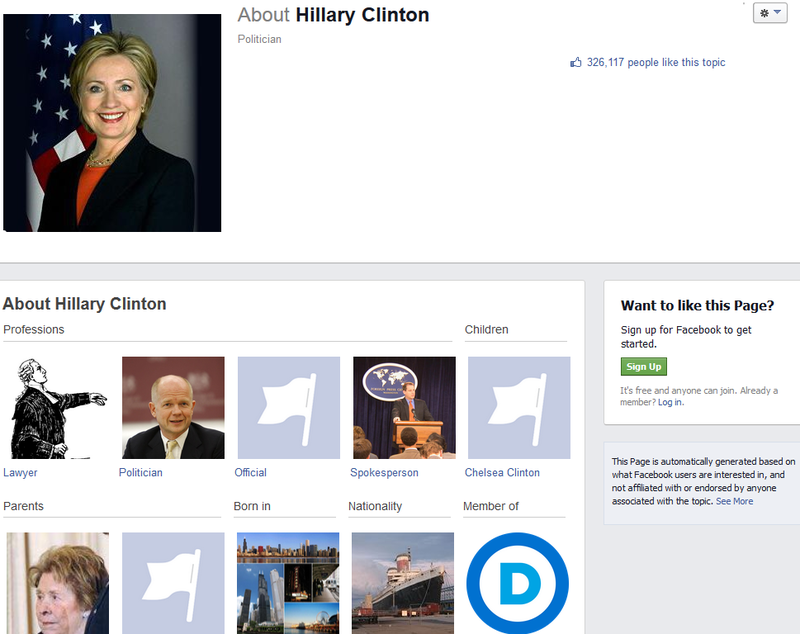 The sections are her biography (some of which is reprinted above in the screenshot), options to volunteer in specific early primary states, a general volunteer button, a Spanish version of the site, and social media buttons. Nowhere on the website does Hillary talk about the issues. As in, what she stands for or her policy positions on anything. So exactly what are people volunteering for? What is her real plan to move the country forward? ...Or to the right, apparently, according to her campaign logo. A red arrow to the right? This could just as easily be a Republican's logo. From what I can tell, the blue stripes are the coasts of America and the white stripe represents the centre. The red arrow rightward means she wants the country to turn Republican. Well, I'm okay with that. Well, what would Hillary say to not outlining her policy ideas? "What difference, at this point, does it make?" It doesn't matter what Hillary's policies are! And how dare anyone oppose her! She must sail, unopposed, through the Democrat Party primaries. And how dare those sexist, repugnant Republicans stand opposite of her in the general election! Hillary was beaten out before in 2008, and the 67-year-old must not let that happen again! What, you think Americans deserve some effort from their presidential candidates? The nerve of you! Oh yeah, Hillary won't be making any campaign speeches for a while. America will get a speech from their future queen only in May. The April thing was just to get some earlier donations in. But that's okay. You should be grateful you can hear her shrill voice at all, for she is already your monarch and doesn't have time with dealing for peasants. She sees herself as the Storyteller from Professor Layton Vs. Phoenix Wright: Ace Attorney. Your fate comes from her, and any appearances from her outside her tower are made in carefully-calculated grandstanding. As in, this is an auto-generated page and she didn't even have one. So what can we conclude about the woman who wanted to assault the videogame industry's rights? She's being awfully silent about why she should be president... Only that she should be president. An America with Hillary Clinton as the president would be far more horrific than any Silent Hill videogame. And I'm too afraid to even touch those. By the way, Rawk wanted me to tell you people that Hillary is eligible for the Smash Ballot because she appeared in NBA Jam on the SNES. And I want to tell you people that having her on the presidential ballot is bad enough, so don't even think about it. Ludwig hopes that Hillary gets opposition in the Democrat Party primary so there will be more debates to watch besides the Republican Party ones. 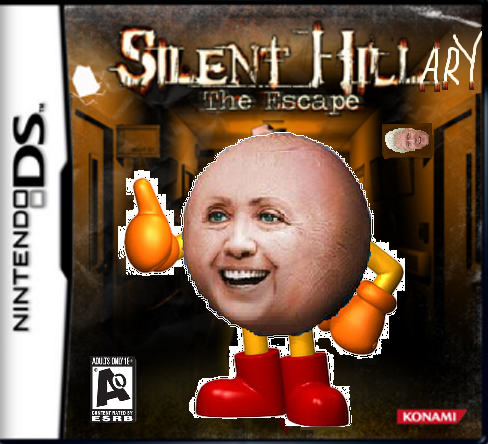 Silent Hillary may be canceled since Silent Hills is. More on the debate process here and what it should be. Why would America be so horrifying? Let's see what America would look like if Hillary's policies have been implemented. Warning: It's not good for videogames. Hillary may be going from Silent Hillary to Mad Queen Hillnard. Hillary is a lawless criminal and is horrifying. I came just for Silent Hill. I blogged about it too today, although my blog was less about politics and more about canned light bulbs.